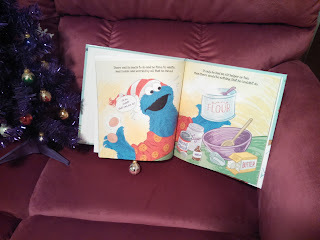 In Bed With Books: Review and Giveaway: 'Twas the Night Before Christmas on Sesame Street! Review and Giveaway: 'Twas the Night Before Christmas on Sesame Street! You can customize this book with the recipient's name, a dedication, and a hi-res photo. After the story, there is a cookie recipe (by Cookie Monster, natch) and a custom ornament that you can cut out and hang on your tree. You can double-check that everything is done right in the book builder engine before ordering your copy. My comments about the quality of these books stand: The pages aren't as glossy as some, probably due to the custom printing, but they are a nice weight. The bright colors print well. There's plenty of white space in the name tags and dedications for longer names. I also like that the name is used throughout the story, not just on the cover. Grant is a total Sesame Street fiend, so I know that he'd love this book even if it weren't personalized to him. That's just an extra touch to make it a great gift. I'm excited to slide this book under the tree for him. Enter to win the Personalized Christmas Book Bundle from Put Me In The Story! ‘Twas The Night Before Christmas on Sesame Street! I'll have to taste test it soon!